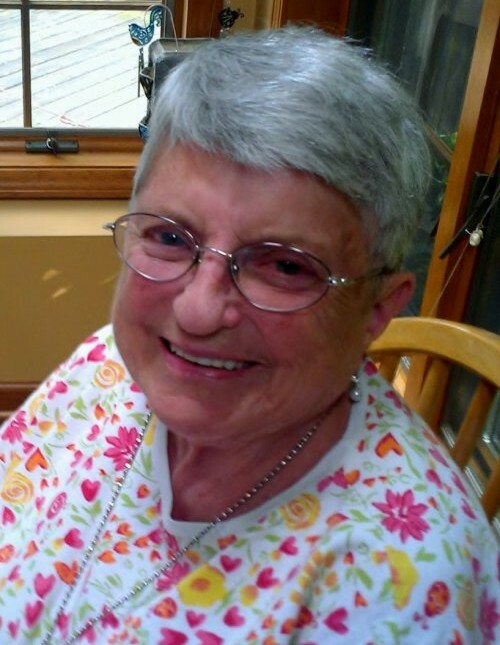 Patricia (Dyson) Donahue, 83, of Cheshire, passed away peacefully with her husband by her side on Sunday, March 31, 2019 at the Summit at Plantsville, after spending a wonderful day surrounded by her family. She had been the loving wife of Simeon J. Donahue for 63 years. Born in Waterbury on December 31, 1935 to the late Ernest and Marion (Lee) Dyson, she had been a longtime Cheshire resident. Patty was a loving wife, mother, grandmother, great-grandmother, sister and friend. Nana was a kind, generous and selfless woman who will be remembered for her devotion to her family. She was a talented artist, an excellent cook and had a great sense of humor. In addition to her loving husband Simeon, Patty is survived by four children: Stephen Donahue (Debra), Nancy March (Chuck), Daniel Donahue (Arnold Olson) and Michael Donahue (Lesley), four grandchildren: Patrick Donahue, Kate March (Paul Kellogg) Allison Proulx (Joe) and Charles March, two great-grandchildren, Brynn and Abby, her best friend and devoted sister, Nancy Gervais (Philip) and her niece and nephews. In lieu of flowers, donations in Patty’s memory may be made to St. Jude’s Children’s Research Hospital, 501 St. Jude Place, Memphis, TN 38105. A Mass of Christian Burial will held at 11:30 a.m. on Wednesday, April 3, 2019 at the Church of St. Dominic, 1050 Flanders Rd., Southington. Burial will be private and at the convenience of the family. Calling hours will be held before the Mass from 9 – 11:00 a.m. at the Plantsville Funeral Home, 975 S. Main St., Plantsville. For online condolences and directions, please visit www.plantsvillefuneralhome.com.